The baby Crissy was cuter. Sounds like you and I had the same pixie hair cut, at the same age! Ha! Mine came when I was five. My Grandma Miller took me to the "beauty parlor", and when they were through with chopping my hair, I felt anything BUT beautiful! Amy.....You and I would have made awesome playmates. I WISH I had a photo of what I did to one of my dolls. Curling iron....yes.... needless to say it melts doll hair. She was so bald and ugly I scared myself. Gin, clearly you and I were not meant to play together as kids. We probably would have ended up burning our houses down. I melted the hair on one of my dolls, trying to give her "boing-boing" curls like I'd read about in the Ramona books. That Laura mask is enough to traumatize kids for life! GAK! I think Little Joe looks like Fonzie there! I wish they made Little House figures, they would have been cute. Charles probably would have had this wild hair. Location : Curled up with a great book. Yes, Amy you and I would have gotten arrested. Oh, but what fun we would have had! I'm surprised they never had more toys, character figures, barbie dolls, etc. Maybe Michael Landon thought it wouldn't be a good idea or it wasn't his call. I know one thing, money would have flowed, the little house replicas and figures would have sold like hot cakes for years and years. Has anyone seen or gotten a script from Ebay? I did for another series years ago for a friend, but don't know if I will for LHOP. I agree about the mask. Has anyone seen any magazine clippings of Little House from 16 or Tiger Beat magazine? I'm sure it was probably featured in those magazines when it was originally on in the 70's. This is a find...I have never seen this before! She is CUTE!! I've never seen that one on Ebay...looks more like her than other ones. Are you going to get her Amy? She is really cute! I wish I could Gin. Now's not the time though....gotta focus on others for Christmas, not myself. I figured I'd post it here though, in case any prairie pals might want to try for her! The don't recognize them either. They say Jonathan Gilbert is in that photo, but it's Patrick Labyorteaux. Oh, the Carrie doll is cute too! Too funny, you can tell a lot of flashes were going off during that picture. Does anyone recognize the woman to the left of Melissa Gilbert? And I wonder who's standing right behind her? Where is Karen Grassle? 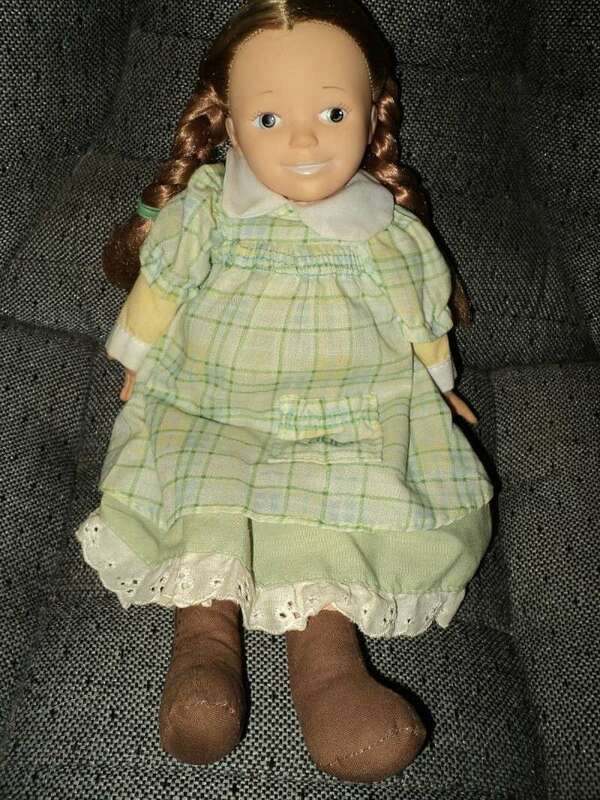 You should see the Walton dolls on Ebay....ugly. I liked the Bonanza dolls, they looked like the characters, but sometimes you wonder how they came up with the looks. I wish "Barbie" did LHOP...they usually get it pretty close. They do a good job at times, I bet they would have been adorable. Kind of surprised to see the Laura Knickerbocker doll sold for only $24.87! Seems like she'd be worth more than that! Kinda sorry I didn't get her now. By the way, Littlehouselover, I just noticed the picture of that mug! That is awesome! Sure would love to drink my morning coffee out of that!